The relationship of Virgo and Aquarius can be a little more challenging than others, but compassion and understanding can most certainly make it work. Misunderstanding each other’s unique and different love natures is most likely to create troubles because Virgo wants security and Aquarius wants freedom. An Aquarius man has a very good take on life. He is a social butterfly with his many friends and acquaintances always around him. This man can see the past, be in the present, while seeing the future all at once. Aquarius man is well rounded and intelligent and also makes for a great humanitarian. He is often detached from the rest of the world but still he enjoys long-term relationships and is quite old fashioned. A Virgo woman is calm and cool on surface, existing on the sidelines as more of an observer at first. In all aspects of life, she needs structure and efficiency. This is because she is extremely analytical, and uses her powerful observational skills to help her gain a precise and realistic view of the world around her. In a relationship, she is a sincere mate unless she finds her man to be unreliable. At the same time she also finds public displays of affection as insolent and tacky. She is flexible in nature and truly loyal and willing to give unselfishly to the man she loves. At the initial stage both may be attracted towards each other’s personality. But, as time advances they may move away from each other. There are very least chances of stability in this relationship. An Aquarius man is dominating and demanding which may create a crack in their relationship. Virgo woman may be fascinated by his positive nature but soon be disappointed for his bad temper. This love-match should be avoided as the compatibility is not too good. 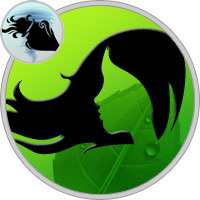 It takes a great deal of patience on the behalf of Virgo woman for her relationship with Aquarius man to work. The Virgo woman enjoys being a wife and a mother — she takes great care of her family when they are ill or in need. He might find himself taking advantage of her good helpful nature since when in love with a man her devotion is unmatchable. She does not believe anyone owes her anything, which makes her very self sufficient and that gives Aquarius man a more careless view towards family and life. The downside to a Virgo woman is that she can be very critical of others including her man, knowing her way is the right way. Just behavior can make him detached and cold towards her leading to many new problems in their relationship. Aquarius man is talented enough to be able to ball all of the things into one and achieve great results that sound very impressive to the Virgo woman. He shows her many new colors of life and gives her wings to fly and discover the dimensions never seen or heard. He becomes fascinated with many things and takes on many projects which cause him to neglect her from time to time. He does not do this purposely; it is that he has a curious mind by nature that needs to constantly be engaged. What brought these two together in the beginning slowly fades if he does not allows her to become involved in his interests. If he does not involve her, she becomes suspicious and begins to lose trust in him. Once she begins to not trust her Aquarius man, she starts to smother him not giving him the independence and freedom he needs to survive. Love is a canvas furnished by nature and embroidered by imagination, in case of Aquarius man and Virgo woman, furnishing is done by her and imagination is his part of the job. The Aquarius man and the Virgo woman have a beautiful union when they actually get involved with the purest and deepest feelings to share with each other. She always possesses the practical nature the relationship needs for stability and he continues to have the daydreams that keeps things light and enchanting. He melts the ice of his Virgo woman and makes her tremble with anticipation in the relationship and she promises him the hope for the future. Every bit of earth and every blow of breeze are full of new excitements and involvements for them to be happily enjoyed in each other’s arms. The sexuality between the Aquarius man and the Virgo woman is the best attribute of their relationship. In fact it is the strongest bond that keeps them intact. He has many different attitudes toward sexual pleasure. One, if not many, will do the trick for his Virgo woman, stirring her sensuality and making her more expressive during love making. On the other hand, she is also able to arouse him to have more desire by nature than other woman. He makes her feel wanted, desired and physically needed, what more can a woman ask for. In their sexual intimacy there is a sort of antipathy, or opposing passion. Each strives to be the other, and both together make up one whole. Also the Aquarius man makes her feel as though without her sexual pleasure he cannot go on living. This is altogether a quite passionate paring with both the partners feeling unexpectedly satisfied in each other’s arms fulfilling their partner’s desires and making their love making a well worthy experience. One thing that Aquarius man and Virgo Woman have in common is that they are both dreamers by nature. They are both indeed very intellectual beings, but that does not stop them from dreaming. Besides the magnetic sexual connection and dreams they share, there is not much else going on between them. There may be initial attraction but apart from that, there are hardly any positive attributes that may contribute to the relationship’s stability. In fact with time Virgo woman may also find her Aquarius man less considerate about her. And after a while, once they are off with their pleasant talks and all the common traits start diminishing, the negative traits start showing and making the relation worse. In this relationship, the partners have to accept each other as they are, rather than trying to change each other or else it can end in a bad and unworthy relationship. Copyright © 2019 Virgo Zodiac.